Ennsdorf, Linz, June 2016 – Batch 1 without any errors, large-scale production without waste: The new lean generation of Salvagnini bending machines has made an ambitious development goal a reality. 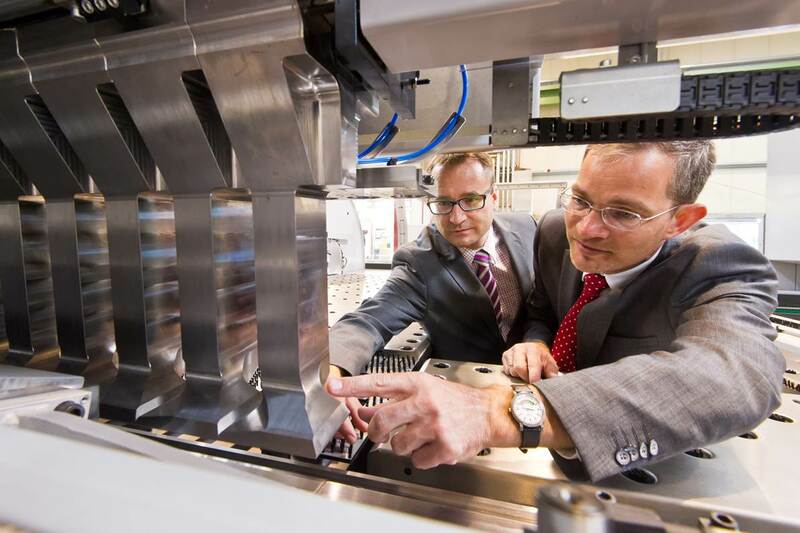 Responsible for this breakthrough is a material recognition mechanism that controls the entire bending process, with the Linz Center of Mechatronics GmbH (LCM) being behind the development work. 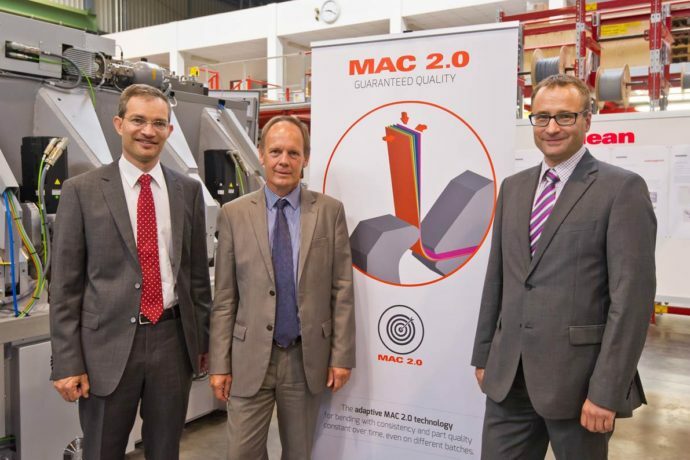 Christened “MAC 2.0” by Salvagnini , the new technology simultaneously increases the service life of the machines. However, the lean generation of bending machines also comes with other impressive new features: decentralised drives, reduced energy consumption, a clear weight reduction, the compensation of thermo-mechanical influences, condition monitoring, an Industry 4.0 link and the elimination of set-up times. “We have translated highly complex simulation models into a simple software,” LCM CEO Gerald Schatz summarises the development of the automatic material recognition process. In numerous computer simulations and targeted measurements during bending processes with a wide variety of sheet metals, the Smart Automation Team from LCM looked for consistencies in their mechanical properties . “If we are familiar with these properties and their influence on deformation, we can control the entire bending process so that the exact end product always emerges – regardless of the quantity, sheet thickness or quality of the material,” outlines LCM developer Christian Zehetner. The decisive factor here is the flow curve. This term describes the relationship between tension and expansion in the workpiece – in the specific case of bending. For this, aluminium, stainless and high-strength steels were tested along with various batches of material. “We had reference values from special sheet metals with precisely defined material properties,” explains Zehetner. All the findings from simulations and material tests were ultimately packed into a software – the bending formula. This controls the entire bending process fully automatically. “Sensors on the drives of the bending machines measure how the workpiece responds to pressure within milliseconds, thereby determining the material properties,” says Zehetner. As a result, the tool path’s final point, which is adapted to the material, is calculated at the very start of the bending process. This is done for every point up to the point at which the clamped workpiece has to be bent, so that it corresponds exactly to the predefined dimensions. “This enables the production of individual pieces without the dress rehearsal,” says the LCM CEO. In actual fact, MAC 2.0 not only ensures that batch 1 is exactly produced right away, it also guarantees a minimal loss of quality in large-scale production also – even with different batches of materials. With high-quality sheet metals, the angle error is max. 0.5 degrees; with poor-grade metals, it is max.1 degree. MAC stands for “Material Attitude Correction”, a term that describes the excellent innovative impact of the new bending machine generation. As the bending machines log the specific forces that have an effect on the drives, this means that preventative maintenance is also possible. 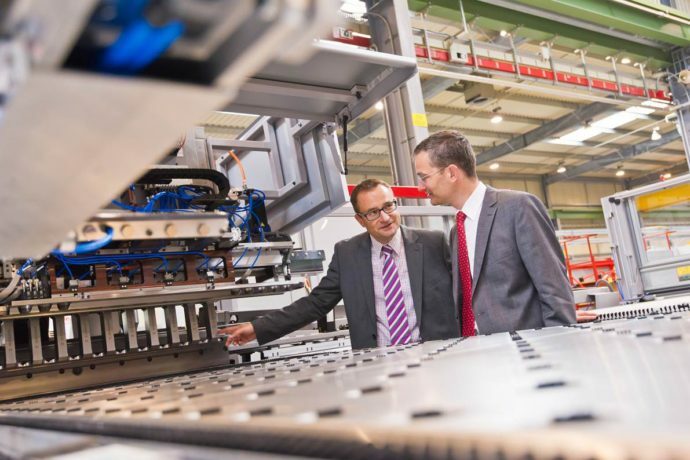 “Salvagnini bending machines promptly provide information on whether components have to be readjusted or replaced,” emphasises Wolfgang Kunze, Chief Technical Officer (CTO) of the Salvagnini plant in Ennsdorf (Bezirk Amstetten). “This prevents downtimes and enables maintenance work to be performed outside of the production process.” As the CTO of the development site, Kunze always outsources complex development projects to LCM. “LCM’s unique competence in developing marketable solutions on the highest scientific level significantly increases the impact of our development work,” emphasises Kunze. Around 40 Salvagnini developers worked on the lean generation and achieved even greater basic improvements. For example, a new, decentralised and thus energy-saving drive concept was realised. Now, electro-actuators with closed hydraulic cylinders ensure an exactly dosed bending process with a pinpoint accuracy. This not only considerably reduced the use of energy, but also the wear of the bending tools. A new tool exchange system eliminates set-up times, thereby enabling a delay-free production of batch 1. Salvagnini Maschinenbau GmbH in Ennsdorf is the development site for bending machines. The Austrian subsidiary of the Italian Salvagnini Group, it is the world’s largest production site specialised in bending machines. The company employs a staff of 370 and has a turnover of € 100 million. Based in Sarego (Vicenza), the parent company recently generated a group turnover of € 280 million with a staff of 1,450 employees. 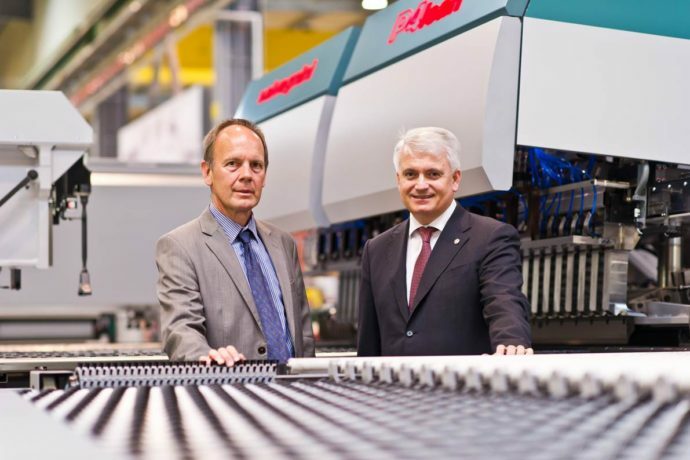 Salvagnini’s specialised machines can cover the entire sheet processing procedure, from storage to punching, laser cutting, folding and bending – and now an Industry 4.0 solution for the entire process has been added to its portfolio. “These production processes have been completely linked,” says the Salvagnini CTO. “When the production order is commenced, the system collects the sheet metal from storage and carries out all the production steps fully automatically until the final product is produced.” Alongside the Electrolux Group, companies such as Hörmann, Kone, Schindler and Zumtobel all use bending machines from Salvagnini.